Without Zack Greinke, the Angels’ pitching staff is still suspect, and their bullpen remains questionable. The two impact free agents have been accounted for, and both wound up in Los Angeles, deeply enhancing their new teams and setting the stage for a potential freeway World Series if both teams play to their expected levels. The Dodgers got Zack Greinke, the best pitcher on the market (taking him from the Angels), and the Angels wound up with Josh Hamilton, the best offensive player. These are either the “LA Baseball Wars” or just two franchises making a lot of money who want to win badly. Both teams have electrified their fan bases, are sure to increase viewership on their huge cable networks, and will increase season-ticket sales. Graphic: Can Alex Rodriguez still catch Barry Bonds? “I think when we took over we had about 17,000 season ticket-holders, which may have been an all-time low, and we’re up around 25,000 right now,” said Kasten. “Our TV ratings were up the second half of last season and we’re all just looking forward to what the season brings. How about the competition with the Angels in the LA market? And a possible freeway World Series? The Angels, who last season were in danger of not drawing 3 million fans for the first time in a decade, obviously need more than a productive Hamilton to get to the World Series. 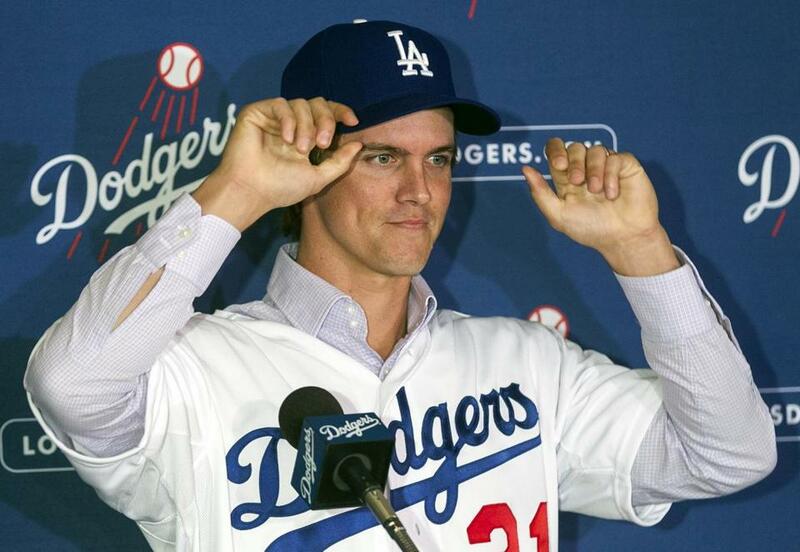 They reacted to all the publicity generated by the Dodgers with this move. Without Greinke, the Angels’ pitching staff is still suspect, and their bullpen remains questionable, even with the addition of Ryan Madson and Sean Burnett. Signing Rafael Soriano might make some sense. Other teams also have improved this offseason. The Tigers, who were able to keep Anibal Sanchez and sign Torii Hunter; the Blue Jays, who obtained Jose Reyes, Josh Johnson, and Mark Buehrle; the forever-bad Royals, who added James Shields and Wade Davis; and the Red Sox, who, if anything, have altered the structure of the mid-tier free agent market with their $13 million-per-year deals to three players many believe are on the downside of their careers. The Red Sox shouldn’t, and don’t, care what the rest of baseball thinks. For years they were the Dodgers/Yankees, and now they’re attempting to take the middle of the road with over-30 players, limiting the term and bridging to their young players. The Red Sox, however, have seemingly improved their 69-win team. We’ll see how close they get to 90 wins. Looking around, the Reds finally found their leadoff hitter, and a productive one, in the Indians’ Shin-Soo Choo, moved Aroldis Chapman to the rotation, and signed Jonathan Broxton to be their closer. Then there’s the flip side. The Rangers, who made it to two straight World Series before bowing out early in the playoffs last season, have taken a major personnel hit. They lost Hamilton to the rival Angels. They lost out on Greinke and failed to sign Hunter. They traded their all-time hits leader, Michael Young, to the Phillies for two righthanded relievers. They lost Mike Napoli, Ryan Dempster, and Koji Uehara to the Red Sox, and Scott Feldman to the Cubs. So far, the Rangers’ efforts to land Justin Upton have been rebuffed because they won’t deal Elvis Andrus. Greinke was a frustrating loss for the Rangers because he acknowledged at his introductory press conference in LA that “at one point I was leaning toward Texas.” He said that one thing that might have swayed him was that the Ballpark in Arlington isn’t exactly a paradise for a fly-ball pitcher and that the ball doesn’t carry well at Dodger Stadium. Greinke determined that the Dodgers were “as deep as any team I’ve seen.” And that was after he studied their minor league talent, as well. Rangers GM Jon Daniels tried to obtain Shields from Tampa Bay, and did so by building a three-team deal also involving Arizona in which the Rangers would also wind up with Upton. Instead, the Rays sent Shields to the Royals, and the Diamondbacks got the shortstop they wanted (Didi Gregorius) without dealing Upton. The Rangers were frozen out in each deal. The Yankees have re-signed some of their own free agents. The biggie was Hiroki Kuroda, but also Andy Pettitte, Mariano Rivera, and Ichiro Suzuki. To this point, they have let Nick Swisher walk, and after their bad news on Alex Rodriguez, they went out and signed Kevin Youkilis to a one-year, $12 million deal. The Yankees aren’t going to be a bad team even with the losses of A-Rod and Swisher. They still have a formidable lineup, and Ichiro and Youkilis should improve their on-base percentage. To this point, the Orioles haven’t improved. They lost Mark Reynolds and haven’t replaced that bat with anyone of note. Nor have they added a veteran starting pitcher. But they seem to be waiting on Adam LaRoche. The Rays traded two significant pitchers and still are deep, and then signed Roberto Hernandez (formerly Fausto Carmona), which could yield a big return. They also added phenom outfielder Wil Myers. But like Red Sox GM Ben Cherington said, winning the offseason doesn’t mean you win the regular season. But right now, the LA teams are looking better than most. Brewers GM Doug Melvin bid strongly for Ryan Dempster, but couldn’t quite extend on the money the Red Sox gave him. Dempster asked the Brewers for a three-year deal, but Melvin, like the Red Sox, didn’t want to go three years. How will Dempster do in the American League? Melvin doesn’t necessarily believe he’ll go after any other veteran pitcher, unless ShaunMarcum, a free agent, wants to return. Marcum said recently he would be open to coming back to Milwaukee. 1. Admittedly, we put way too much emphasis on offseason acquisitions. Albert Pujols didn’t land the Angels in the playoffs. Jose Reyes didn’t make the Marlins a contender. Adrian Gonzalez and Carl Crawford didn’t lead the Red Sox to the playoffs. Rather, it was the Giants’ acquisition of Marco Scutaro that helped them win the World Series. Having said all that, fans want to see great performers. 2. Interested to see whether Kevin Youkilis is truly on the downside because of injuries or whether he can be what he once was. The Red Sox clearly thought he was on the downside, and his performance in Chicago gave credence to that. 3. The R.A. Dickey story is fantastic, as was his 2012 season. But he’s a knuckleballer. Let’s see if he continues to perform at such a level for whichever team deals for him (Toronto?). Knuckleballers can be erratic, but if the Blue Jays get him, that’s a pretty good staff. 4. Roger Clemens, Barry Bonds, Sammy Sosa, Mike Piazza, Jeff Bagwell, Craig Biggio, Alan Trammell, Tim Raines, and Jack Morris were all checked on my Hall of Fame ballot. 5. The Red Sox have rebuilt with high-character players. Now the question is, are they talented enough? 6. Gary Sheffield, now an agent, cut a nice deal for client Jason Grilli — two years, $6.75 million. 8. A lot of scouts love Tigers right fielder Avisail Garcia, who has been pushed out by Torii Hunter. Would be an interesting player to grab. 9. One of the best press boxes in America — at Angel Stadium — will be a thing of the past when the team moves the media to right field next season. 1. Rafael Soriano, RHP, free agent — Where the Rangers have lost so many players, they could solidify their bullpen with Soriano. The Red Sox may also be interested, and while the Tigers are still keeping their distance, it’s not far-fetched that Soriano ends up in Detroit. Soriano is a Scott Boras client, so there will be careful examination of the market before a decision is made. 2. Nick Swisher, 1B/OF — He could also become a target for the Rangers. It’s difficult to replace Josh Hamilton, but Swisher has been a consistent player who could benefit from the Ballpark in Arlington. The Indians also have been major suitors, but would Swisher want to go somewhere where he may not win? The Mariners, who made a cursory run at Hamilton, could also be a fit. 3. Peter Bourjos, CF, Angels — The outstanding defender won’t have a starting job with Hamilton in place, but the Angels still need defense, especially with Mark Trumbo in right field. According to Angels sources, they would consider a deal, but are in a position where they don’t have to move him. 4. Edwin Jackson, RHP, free agent — Jackson may be the next pitcher to strike a deal. Teams have always been apprehensive to sign Jackson long term, and he again is coming off a questionable season. The money-infused Blue Jays are hovering for someone to complete their staff, and Jackson could be the guy. The Padres also have great interest, especially after losing Andrew Cashner for a while after his hunting accident. 5. Michael Bourn, OF, free agent — It will be interesting to see where Bourn’s market goes. Some believe the Yankees are quietly interested and will pounce if the price comes down, which would give them the leadoff hitter they have wanted for some time. The Rangers remain a possibility. 6. Rick Porcello, RHP, Tigers — Amazing how much Porcello’s stock has dropped, from a phenom to a pitcher who couldn’t fit the Tigers’ postseason rotation. GMs have told me the Tigers have been receptive to trade talk on Porcello, who was 10-12 with a 4.59 ERA and a 1.531 WHIP. Porcello is only 23, so he has appeal as a pitcher who has yet to reach his prime. The Rangers, Pirates, Blue Jays, Red Sox, Padres, and Phillies are possibilities. 7. Justin Morneau, 1B, Twins — Teams inquired about him at the Winter Meetings, but it wasn’t enough for the Twins to cut bait. Morneau is heading into the final year of his contract for $14 million. 8. Jacoby Ellsbury, CF, Red Sox — A few front-office folks around the league still feel the Red Sox may be able to move Ellsbury. Teams like Texas, Atlanta, and Philadelphia are looking for outfield help. 9. Adam LaRoche, 1B, free agent — If the Red Sox can’t finalize the deal for Napoli, they could give LaRoche the three-year, $39 million contract. Otherwise, LaRoche may stay in Washington or eye a job down the road in Baltimore, where Dan Duquette has coveted him. Since the contract snafu on Napoli, LaRoche could actually be a better option for Boston. From the Bill Chuck files: “There isn’t that much difference between the career numbers of Zack Greinke: 3.77 ERA, 1.247 WHIP, H/9 8.9, HR/9 0.9, and SO/9 8.0 and the career numbers of Anibal Sanchez: 3.75 ERA, 1.346 WHIP, H/9 8.8, HR/9 0.8, and SO/9 7.6.” . . . Wish Rudy Pemberton (43), Curtis Pride (44), Bob Ojeda (55), and Rollie Sheldon (76) a happy birthday on Monday.